In collaboration with Cragnolin Design and Engineering and Iris Development we proposed resilient affordable housing for 30+ scattered sites in flood risk areas of New York City. In collaboration with Cragnolin Design and Engineering, JGV management inc. and Gary Allen Modular Construction we proposed an affordable housing building for the Grant Street Municipal Parking Lot in the Brooklyn Neighborhood East New York. 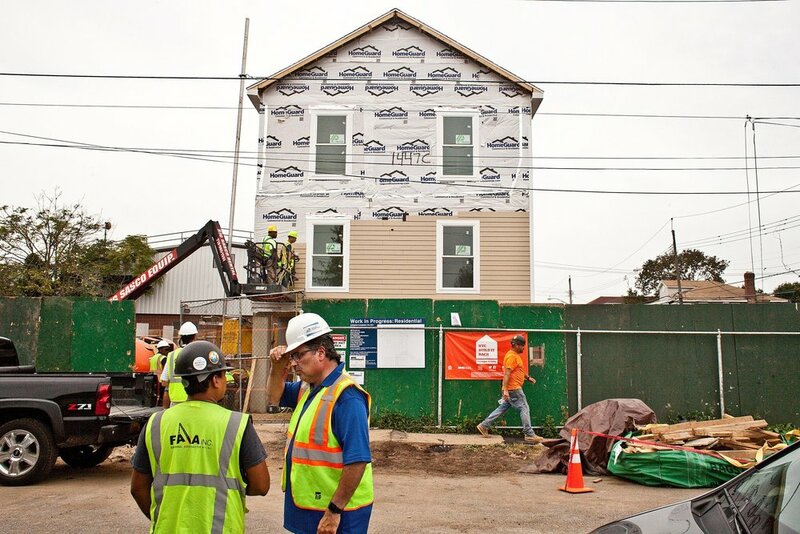 In collaboration with Cragnolin Engineers we work on recovery from Hurricane Sandy as part of the Build it Back program from New York City. In collaboration with Cragnolin Design and Engineering and JGV management inc. we proposed an affordable housing scheme for the Broadway Triangle in Brooklyn NY. A Case Study of Social Housing in New York City. If anything is typical for the demographics of New York City, it is its character of enclaves. While higher level demographic data show a diverse, vibrant melting pot, small scale New York City is relatively segregated. This landmarked building in the city of Bredevoort in The Netherlands is converted from a single family house to 2 apartments. The design encompasses renovation of the existing structure as well as configuring the 2 new apartments. In this landmarked former bank building in the city centre of Amsterdam, we proposed a radical reconfiguration of a penthouse. Together with VASD Architects, we converted this building in Amsterdam into a multifunctional cultural center. Studio K is a cultural complex in Amsterdam. Together with Inbo architects, we converted an old school building into a cinema with 2 screening halls, a theater, nightclub, bar, and restaurant. Build it back features in The New York Times. Read about our work in this New York Times article (link). HONORABLE MENTION FOR MARCY HOUSES! Marcy Houses: A Case Study for Social Housing in New York City won an honorable mention at the New York Affordable Housing Challange. The project was presented at the New York Build expo 2017 together with the other winners of the competition. On Februari 23rd the Archiprix 2017 show opened at the Technische Universiteit in Delft. The show will run through late March 2017 after which it will tour the country. Please visit www.archiprix.nl for latest locations and hours. Together with Het Verschil and architect Jeroen ter Maat we won the tender to convert this mid century modern church building just outside of Amsterdam by world famous architect Gerrit Rietveld into 10 apartments and an event space.